The challenge many athletes have when they sign up for a marathon is determining a realistic goal time. How do you know what is a realistic time for 26.2 miles if you’ve never run this far before? Even if you have run numerous marathons, many middle age runners are not only getting older (with the glory days well in their rear view mirror), but they simply don’t have the time to train like they may have in the past. In this post I will provide you with a simple, yet proven system to help you determine a realistic marathon goal time and also how to figure out the paces at which you should be training to achieve your goal. Understanding what you could potentially run at your upcoming race based on a recent performance helps to take the guesswork out of your training. If you are able to set realistic race goals, then you will be able to train at the appropriate paces for your ability with the end result being a performances that is consistent with your training and fewer disappointments in your races. Unless your goal is to simply finish the marathon, most people have a goal time in mind. The key to determining a realistic goal & proper marathon training is having a finishing time that corresponds to your abilities and current fitness levels. Once you determine this realistic goal time, it’s easy to map out your training paces. First we need to understand the concept of Equivalent Performance. This is the equivalent race time of one race distance based on a recent race time of yours from another distance. Ideally you want to use a finishing time from a recent race (within the last few months). A marathon or half marathons is best, but not completely necessary. What’s important is that you don’t choose a goal time that you simply want. There is a process which works very well, that I will discuss below. Besides previous races, your current fitness level and the kind of plan or coaching you plan to use to prepare for the race will be used to determine your realistic goal. If you haven’t raced for a while, then there’s some workouts we can use to help establish our current condition. 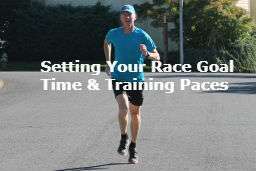 I use pace/performance calculator to determine my equivalent 5K, 10k, 1/2 or full marathon time. The best calculators are from Jack Daniels or Greg McMillan. Although there’s others available, I’ve actually had Greg McMillan help to coach me (through one of his programs), so I tend to use his calculator. Although the calculation won’t be exact, it will be close enough for you to determine a reasonable goal based on your current condition. It’s important to remember that actual results will vary depending on the course, the weather, how well your training has gone and a number of other factors. Also, when using a recent race as your basis for determining a realistic goal, it’s important that the race time accurately reflects your conditioning (where you happy with the result, were the conditions fairly optimal, etc). As an example, I will show you how I used the calculator to set up my goal from last year. Unfortunately, I haven’t run any races since a July 2017 marathon. So with this example, I’ll look at how I developed my goal time for my 2017, 4th of July Marathon. 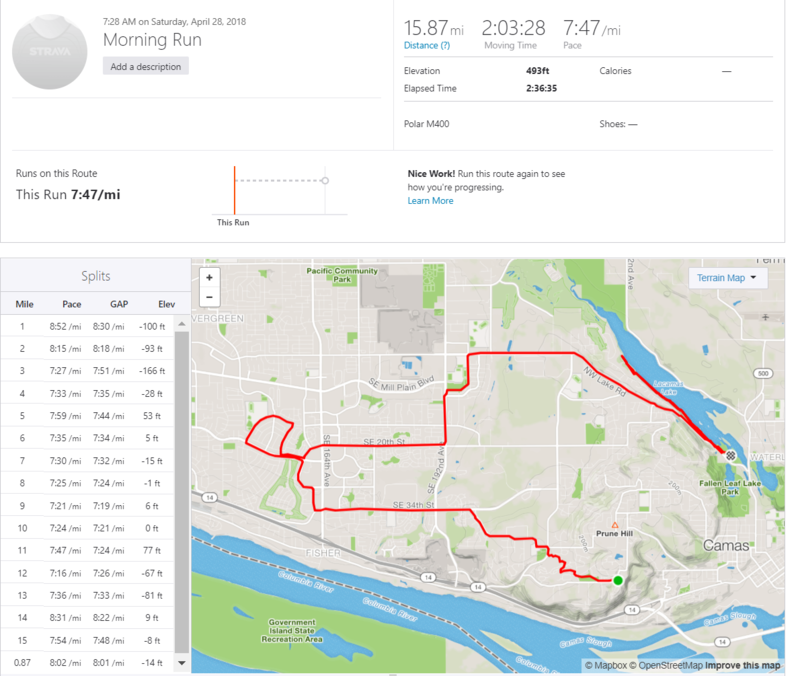 In late February of 2017 I ran a 1:27:45 half marathon at Vancouver Lake, WA. I thought that this may set me up nicely for a goal of a 3:00 marathon. If I plug in the 3:00 goal time and my 1:27:45 into McMillan’s calculator, I instantly get 2 columns of results. One shows me my current times and equivalent performance (or fitness level) for distances from 100m to 100miles. The other column shows my goal times for all of these same distances. It also shows the per mile pace of these times for reference. I find these per mile paces to be very helpful. Sometimes a marathon time doesn’t really mean a lot until you break it down into a per mile pace. As you can see below, there’s an approximate 20 sec/mile difference between the 1/2 and full marathon times. As you can see, my fitness level at the beginning of March 2017 (approx 16 weeks prior to my July 4th marathon) was the equivalent of a 3:04 marathon. My goal time of 3:00 was the equivalent of 1:25:32 1/2 marathon. So, my current fitness level wasn’t quite at 3:00, but it wasn’t too far off. Bottomline, my 3:00 goal was a stretch considering that I needed to improve my pace by 10 seconds/mile. However, this 3:00 goal wasn’t completely unrealistic considering that it was based on a recent race and my goal race was 4 months away, leaving me plenty of time to train and get in shape for a faster race. CRITICAL, VERY IMPORTANT, READ THIS: Even though you use a reputable calculator to come up with a time, there are 6 other factors you need to consider when determining a realistic goal. 1) Course Review – it may be necessary to pick the right race or understanding race course topography to reach your goal. Chicago Marathon is a flat course, but depending on where you start, you may be slowed by the thousands of runners around you. It might be easier to pick a smaller race. 2) Timeline – do you have enough time to train for the race. If you’ve been running and racing and aren’t burned out, you’ll need at least 12 weeks. Otherwise 16 – 20+ weeks is necessary. 4) Other necessary considerations – Do you have time to increase your mileage? How much will you Strength and Cross train? Are you open to using a coach? Are you willing to train with others who can help give you apush? 5) Are you committed to quality recovery (running slow when on your easy days) & 7 – 9 hours of sleep/night. 6) Are you committed to proper nutrition throughout the duration of your training? These are all important factors to consider when developing your goal, especially if you have a goal of setting a PR. If you’re a beginner and haven’t run a race before or you haven’t run a recent race, you might consider running a 5-10k. If you don’t have much of a running base, I wouldn’t run a longer race (in fact, unless your marathon is 6+ months away, you really should consider building in a base or foundation (I discuss how to do this if you follow this link to a beginner runner training plan) to help ensure you can successfully finish your race. There’s so many races in most major cities, it won’t be long before you can complete a race so you can establish your current level of fitness. If you’re a beginner, this will give you some race experience (so you can see if you enjoy running long races). If it’s not possible to run a race, then try one of the following to determine your level of fitness. 1) Run a 5k mile time trail. I recommend getting some training in before you attempt this. If you’re a beginner runner and just getting into shape, follow this link to a beginner’s training plan that will help you develop a base. Just don’t simply go from the couch to a 5k on the next day. After you have a base time, go through the above exercise using a performance calculator to determine your goal time. In this case, you can plug in any goal time. You’re actually only looking at the column that’s current times and looking at your equivalent 10k, 1/2 marathon, marathon or whatever race distance you desire. 2) Run a predictor workout. This option is really only for someone who has been running and can complete this type of workout. 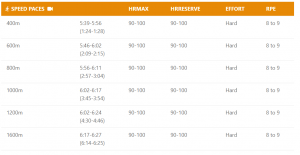 As the name indicates, predictor workouts are often used by athletes to gauge how their training is progressing and to give them an idea of what time they should expect if their race were to be run within the next 2-3 weeks. In this case, you could run one of these workouts to “predict” your time for a 10k. Then you could use the predicted time and a calculator to find your equivalent goal time. 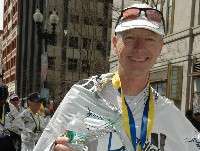 Famed running coach, Jeff Galloway, recommends the following proven workout to predict your 1/2 marathon time. After completing a warm-up and strides (100m), run one mile at a difficult pace, working to pace each 400m evenly. By taking your mile time and multiplying it by 1.2, you will have a fairly accurate half-marathon prediction. Once you determine your goal time. Then you can use the calculator to determine your workout paces. The McMillan Calculator makes this very easy. 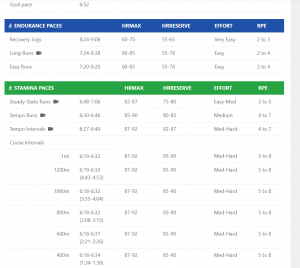 Just click on the link near the top left that’s labeled “Training Paces.” The specific workouts you run will be outlined in your marathon training plan. In my case, I haven’t run a race since last July when I ran a marathon. I had some issues with my feet during that race and I finished well off my goal time, but still a respectable 3:14. I have been running regularly since last July, so my goal this year, is to break 3:00. This is what I plugged into the McMillan Calculator. Below is a screen shot for my paces using this calculator. As you train for the first 3-4 weeks, hopefully you’ll start to see improvements in your fitness. If you established a realistic goal, you’ll likely be running at or very near the assigned paces. Remember that your rate of performance isn’t something that can be standardized. You can follow these guidelines to follow, but the every runner can be different. After about four weeks, if you believe you’re in better shape than your most recent race or you simply want to measure your rate of improvement to see if you’re improving, then run another race. One word of caution is to keep the race as integrated with your training as possible. I suggest running a race instead of a planned hard workout, but make the race consistent with the distance of that workout so you don’t negatively impact your long-term progress. 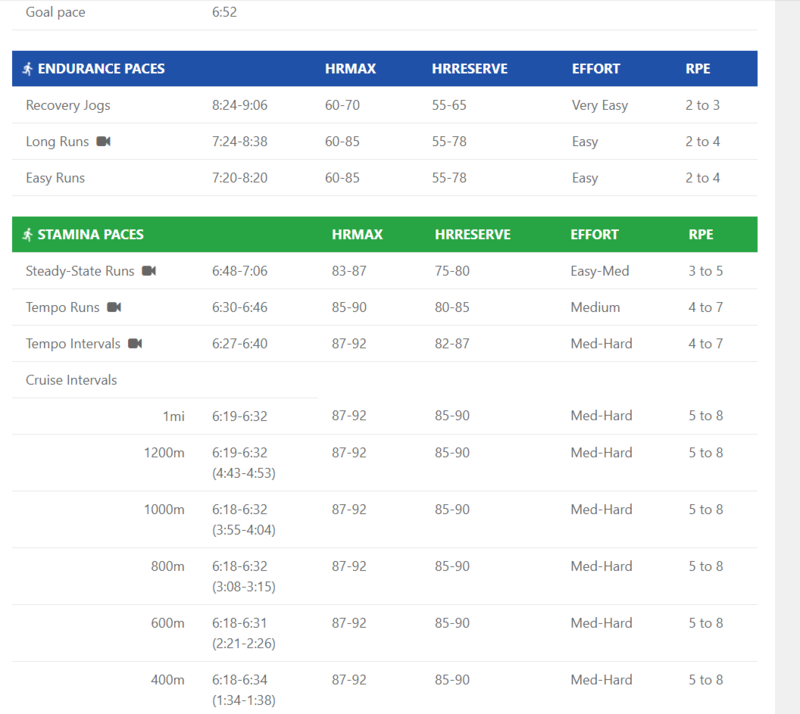 Now, with the new race data, you can plug your time back into the performance calculator from step 1 and see how much or if your goal needs to be modified. If you’re interested in joining me, I can put together either a custom training plan or I can personally coach you. Either program will be specific to your goals and athletic abilities. Just click on the links for details. Workouts from this past week. The purpose of this workout was to recover from yesterday’s 10 mile run. It’s really important to run your easy runs at an easy pace. Even if you feel rested and could go faster, you won’t properly recover unless you keep the pace easy (varies by a runner’s ability, but for me is 8:00 – 8:30/mile pace). Weekly speed (also called interval or track) workouts are an essential part of my marathon training. This week, I’m increasing the distance of the interval, compared to last weeks’ ladder workout. I’m completing 3 x 1600m (or mile) with 400m (or 2:30 – 3:00 rest). My times for each 1600m were 6:21, 6:21 and 6:09. My target time for 1600m was 6:14 – 6:25, so I was within the range and even a little faster on my last interval. In Clovis, CA on this morning for business. Ran 6 miles at easy pace around the Fresno State campus. The purpose of this workout was to recover from yesterday’s track workout. Nice & easy run. Sometimes you may forget your watch. If you do, don’t panic. Just complete the run at your best effort. Today was one of those days for me. My training plan called for a 7 mile Tempo with approx. 1 mile warm-up and 1 mile cool down. This run was a bit challenging because I rarely run hard early in the morning. However, this is great practice for the marathon (which will start at 0630 on July 4th). Also, this run was different because there were no mile markers on the bike trail (Clovis Old Town bike trail). I simply noted that it was 700am when I started the run. I warmed up briefly and then gradually picked up the pace throughout the rest of the run. Same as the previous week, my tempo pace is 6:45 – 7:00/mile. When I returned to the car, it was 8:10, so I believe I was somewhere around 8.5 – 9 miles (I had to stop for a traffic about 4 times which added to the time. Regardless of the distance, the effort was definitely there. I was feeling a little tired and stiff on this run (after a lot of driving the day before) so my guess is that I probably didn’t complete all 7 miles in at target pace. Bike Blast workout at my local gym for 45 minutes. Workout consisted of alternating 1 min hard on stationary bike at varying levels of resistance and then barbell and body weight exercises. The purpose of this workout was to take some time off my legs and build strength to help injury proof my body. I strongly recommend completing conditioning & strength work at least 2 times/week during your training. 3 times per week is optimal during the off season. The goal of this run is to get time on my legs and complete my weekly long run. Bi-weekly, I increase the length of the long run as I progress through my schedule. Ultimately I build up to 18-20 miles. On weeks where I’m not running 14+ miles, I typically run 10-12 miles at easy pace. With tough Tempo and Track workouts every week, I believe it’s important to slowly ramp up the length of the long run. As long as my schedule is long enough (14 – 16 weeks), I have plenty of time to get in the long runs and recover. On this day, I actually was committed to join some friends for a 5k charity run, so I ran 12 miles prior to joining the charity run. 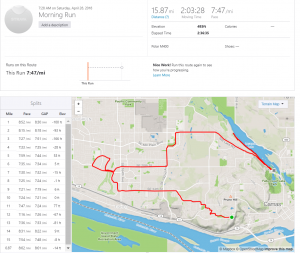 Below is my Strava results of the run. Pace was easy, but I did run a few miles in the mid to lower 7 minute/mile range. I felt good/strong. The last 5k was at easy pace.